Fort Smith Ward 1 Director and real estate developer Keith Lau (standing) meets with residents about plans to build duplexes on North 49 Street. Fort Smith Ward 1 Director and real estate developer Keith Lau is moving forward on his plans to build four-bedroom duplexes at the property he owns on 1001, 1011, and 1021 N. 49th St., despite pushback from neighborhood residents. 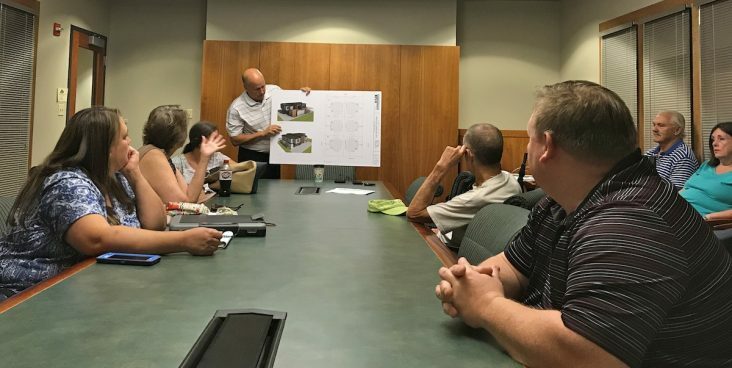 Lau likely got as close as he’s going to get to their approval on Aug. 29 when over a dozen residents met him at the Fort Smith Public Library central branch on Rogers Ave. to discuss the two design plans he had in mind. Lau’s preferred development would include 12 four-bedroom duplexes across a total of six buildings. Each will be priced to attract groups of college students. Lau hasn’t nailed down the rent but mentioned $2,200 per duplex as an example, which would work out to about $550 per room, and it would include utilities, Wi-Fi, and covered parking and storage. Lau agreed he would honor his 10 previous concessions as well as build a landscaped berm between the units and the sidewalk. He also would address the residents’ fears of traffic issues on North 49th by not allowing access from the street. Instead, tenants would need to pull into their entrance on North 48th Street. From there, they would drive in the contained development and park in the reserved areas on the first floors of each of their buildings. In the end, Parks told Lau the residents would show up to the next planning commission study session on Sept. 4 to ensure he keeps his 10 previous concessions and adds the berm and North 48th Street access only to his design plan. Lau said he would and asked the group if he could count on them not to appeal. The consensus was they “weren’t happy” with the development, but did not plan to speak in opposition or file any further appeals. The next voting session of the planning commission is Sept. 11. If it passes without any appeals, Lau will be allowed to proceed without having to go back before his fellow Board members for approval. His previous effort was rejected by the Board in spite of the previous approvals from the planning commission on variances consisting of 25-30-foot setbacks for front and side yards and a reduction of the 10,500-minimum square foot/four dwellings per acre lot size requirement to 9,600 square feet and 4.6 dwellings per acre. Lau has spent at least $15,000 on design work thus far and projected an early estimate the development would cost around $1.6 million. Lau said the units would feature high-quality finishes, stainless steel appliances, vinyl plank flooring, and continuous hot water.